I enjoy the coaching that accompanies my role as a training facilitator for mid to large-sized organizations. As an outsider I can see behaviors and dysfunctions objectively. As a sensor/perceiver, I notice things like eye twitches and subtle flashes of annoyance as they cross participants’ faces. And because I genuinely enjoy people, even the most offensive, outwardly hostile employee doesn’t offend me. They fascinate me. Unfortunately they may not fascinate their colleagues and supervisors. These types of employees spend lots of time in “rehab” being reprimanded, warned, micro-managed, threatened, reassigned and…fired. There is a difference between assertiveness, a positive, unapologetic way of declaring one’s needs and opinions; and aggression, a negative attacking, win-all approach that leaves people feeling belittled and diminished (and plenty angry!). Assertive women and people of color are unfairly labeled as “aggressive” – even by other women and people of color. That is an unfortunate stereotype that I will address in a future post. But most employees of all types experience the wrath of the aggressive co-worker. If you are so labeled, I have helpful tips at the end of each behavioral description. Invariably, these individuals have the sideways glance and smirk nailed down. They know how to glare – beyond staring – to a point where you wonder if their eyeballs will dry out. Others have perfected the “Don’t even think about it” squint out the corner of their eye. The curled lip is equaled only by the pursed ones. The face is the most communicative part of the body and the part of which most betrays our true feelings. Practice your conversations in a mirror. You need to see what others see. Use the video feature on your phone for playback. Check your own reactions when people say or do objectionable things to you. STOP. Just observe what just happened as though it happened to someone else. Monitor your own reactions so that you can choose a response rather than be goaded into one. Counting to 10 – or 50 – really works. Ask a trusted colleague or friend to give you immediate feedback when your body language betrays your professional demeanor. Let them signal you subtly from across the boardroom. Stop being defensive about feedback from others. Just because you didn’t technically say anything doesn’t mean you didn’t say anything. As most professionals know by now, 93% of verbal communication consists of tone, timing, volume and inflection. This is known as paraverbal communication and includes body language, above. Only 7% of verbal communication consists of the actual words used. “I hear you” can be said in a way that conveys that the listener hears the speaker, or it can be said in a way that really means, “Shut up. I’m tired of you yapping!” It’s all in the paraverbals. Like in body language, getting a trusted friend or colleague to give you honest feedback as well as really listening to feedback from others is essential. If your job is on the line it doesn’t matter that you did not curse anyone out. Your message was conveyed well enough. Your actual words can damage relationships and cost you respect, trust, and that promotion you covet so much. Every culture has its norms for personal space, eye contact, certain gestures and posture. In North American mainstream business culture rolling the eyes, standing shouting over a seated person, pointing fingers in another person’s face, are always regarded as disrespectful. Women almost universally have a greater comfort distance from males than vice versa. Tall people towering over shorter people invading their”personal bubble” and scolding them is universally hostile. If you don’t know what the norms are and people are constantly misreading you, ask. Ask for examples of what others deem appropriate. Positioning yourself in a meeting so that your back is strategically turned against someone everyone knows you are displeased with is unprofessional and begs for a reaction. In fact, meetings are a great place to tell who is allied with whom and who is on the outs based solely on non-verbal communication and the use of space and physicality. 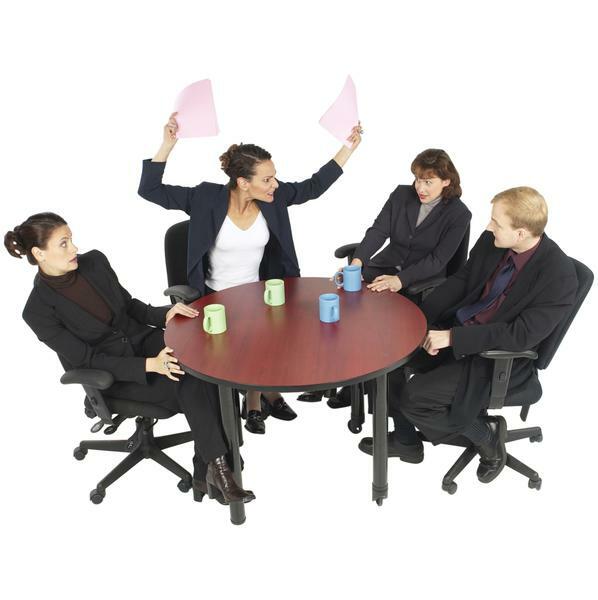 Meetings can be rife with conflict without a shot being fired. Take the neutral stance of a social scientist and become a people watcher. See who stands at what distance from other people and how big or small your own personal comfort distance is. If you start observing others there’s a chance you will pay more attention to the part you play. Troubled employees are usually the least self-aware and the least focused on the reactions of others. You can consciously change that awareness. If you have frequently be labeled aggressive is incumbent upon you to change. A common fallacy among aggressive types is that it is incumbent upon others to change. Not true if you want to move up in business. It is possible to change. Whether this article is for you, a colleague or subordinate, these tips can and do help people to grow, and we’re all works in progress.